Pineapple chicken is a top family recipe. 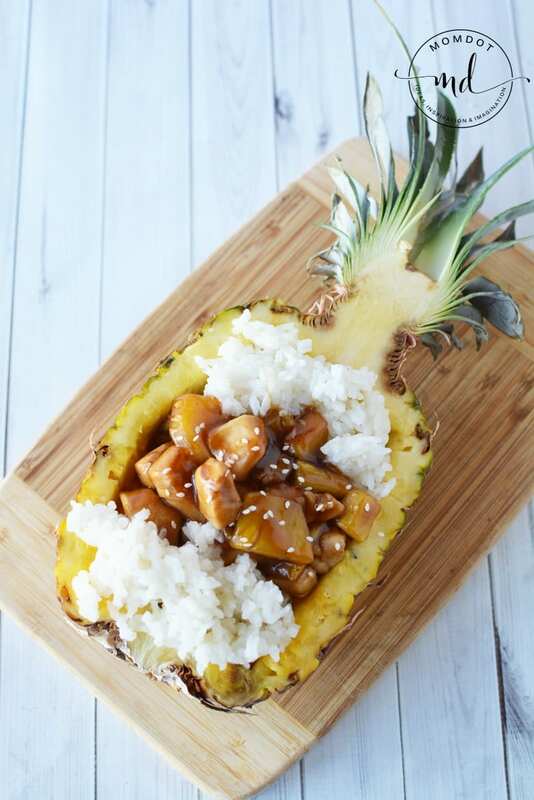 Bursting with flavor, this pineapple chicken recipe can also be easily altered into pineapple teriyaki chicken skewers and served IN a pineapple! Your taste buds will be so excited for dinner tonight! 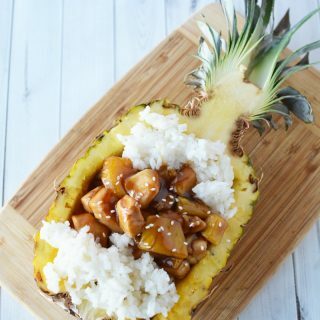 This pineapple chicken recipe can be done in chunks, fingers, or strips but chunks work out the best to serve your chicken in a beautiful pineapple boat, making dinner look restaurant quality in no time. Do not be fooled by the professional appearance of this pineapple recipe, it’s so easy! It can also be altered to create a pineapple teriyaki strip (seen below in additional bonus recipe) with this easy to make pineapple glaze or leave out the pineapple and just make teriyaki strips! And if you like using fruit in your recipes, try this lime chicken pasta salad recipe! No matter how you slice it, chicken is whats for dinner tonight. To cut the pineapple: Slice the pineapple in half, from top to bottom. Set one half aside for another recipe. Slice to each side of the core, but do not cut through the pineapple. Cut 1″ slits across the center and remove the center core with the pointed end of a spoon. Discard Core. Cut around the outside edge of the pineapple, making sure not to cut all the way through the pineapple. Remove pineapple pieces with a spoon. Slice pineapple into bite side pieces. You will need about 1 cup of pineapple pieces for this recipe. This recipe is best served with a side of rice. When it comes to rice, I personally believe jasmine rice has the best flavor and aroma. If you do not own a rice cooker, I highly suggest you get one. Your rice can be started at the top of a recipe and done in 30-50 minutes depending on how you set the cooking time. I have been using a Zojirushi Rice Cooker for years (you can see how it works in this Frushi Recipe) and recommend it! Add chicken and oil to a skillet and cook until chicken is done. Add brown sugar, soy sauce, chicken broth, garlic powder and pineapple pieces and mix well. Heat until just bubbling and add in corn starch and water mixture. Stir until thick. Remove from heat and serve with white rice. Sprinkle with sesame seeds if you like. Pineapple Chicken Recipe that will leave your taste buds singing! Bursting with flavor, pineapple glaze covers your chicken in a sticky but sweet sauce and served with pineapple makes it perfect for sharing with friends. Slice to each side of the core, but do not cut through the pineapple. Cut 1" slits across the center and remove the center core with the pointed end of a spoon. Discard Core. Cut around the outside edge of the pineapple, making sure not to cut all the way through the pineapple. Remove pineapple pieces with a spoon. 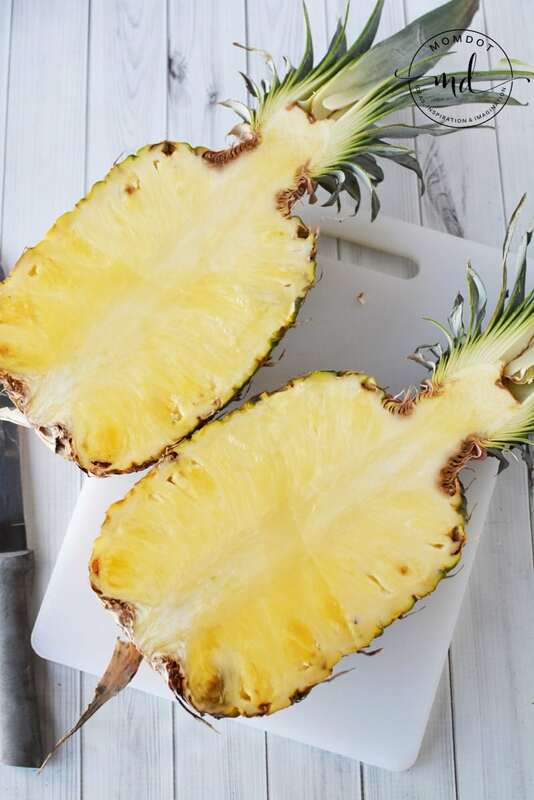 Slice pineapple into bite side pieces. You will need about 1 cup of pineapple pieces for this recipe. Add chicken and oil to a skillet and cook until chicken is done. Season with salt and pepper. Add brown sugar, soy sauce, chicken broth, garlic powder and pineapple pieces and mix well. Heat until just bubbling and add in corn starch and water mixture. Stir until thick. Here is another way to use your ingredients in another pineapple chicken recipe! Mix up your pineapple juice, brown sugar, and soy sauce in a pan and turn on medium-high heat. While your sauce is heating, cut up chicken chunks. Once your teriyaki sauce has come to a boil, remove from heat and pour over your chicken. Let marinade in your fridge for one hour. Discard what isn’t used. Now add your chicken chunks onto grill skewers and grill over medium heat for approx 10 minutes or until all the way cooked. Feel free to add a little pineapple on the grill as well!